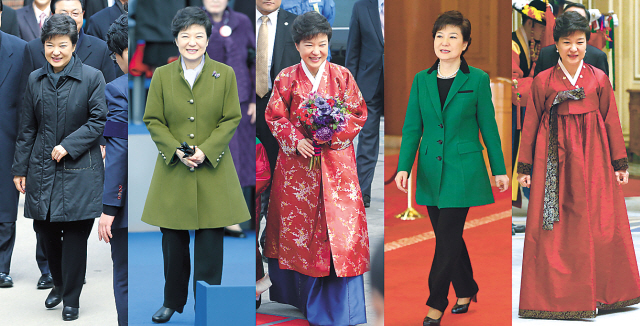 On her inauguration day, President Park Geun-hye was seen wearing five outfits. While Park cannot be charged guilty of vanity for changing so frequently ― each event did call for attire appropriate for the occasion ― those who had looked forward to a fashion moment or two from the country’s first female president were largely let down. Wearing a lightly padded coat to the Seoul National Cemetery was a fashion faux-pas: Such a solemn occasion calls for a classic long coat, in wool or cashmere. The olive green jacket with gold buttons that flared slightly from the waist worn at the swearing-in ceremony recalled for many her late father, a former general who seized power in a coup. If the intention was to elicit nostalgia for father Park Chung-hee who modernized Korea, the new president succeeded, for the military allusion of the jacket was not lost. Style-wise, however, this outfit was not flattering. The lavender scarf and the purple butterfly brooch, perhaps an attempt to soften the harsh look of the jacket, were just confusing. The jacket-coat was too casual for the momentous occasion. The red long coat and blue skirt hanbok ensemble shown at Gwanghwamun Plaza was more flashy than stately, but captured the festive mood of the event, though the reference to the national flag was perhaps too obvious. 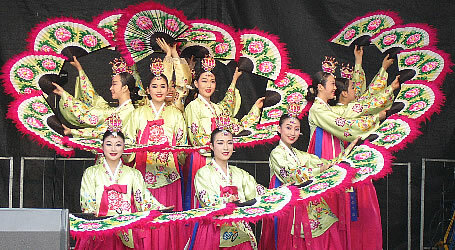 The intense color of the deep red hanbok worn at the banquet seemed to overpower Park. A more regal look could have been achieved with a modern silhouette. Park could take a few pointers from her late mother, who wore hanbok most elegantly. Clothes assume symbolic meanings. As the country’s leader, Park, wittingly or unwittingly, sends messages with her sartorial choices. With time, and perhaps with some expert advice, Park’s style should better reflect her substance.